Tory Johnson seemed to have it all. A great career as a TV Reporter, a loving husband, and beautiful children. It wasn’t until a real conversation with her boss, that made her realize that if her on camera appearance didn’t change, she could lose her job. Even though Tory’s boss never said the exact words “you have to lose weight or your fired”, that is exactly what Tory heard. Tory was in denial, so much so that she wouldn’t wear white on camera, afraid of looking fat, and she skipped on Doctors appointments for 10 years to avoid the “fat talk”. Realizing her boss was right, and that her job in fact was a visual job, she decided to embark on a new journey she never once tried to pursue whole heartedly. This time around a fad diet was not going to do the trick. 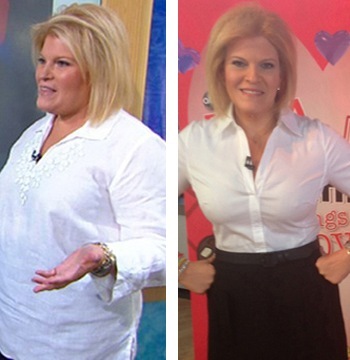 She decided to use the following tips, which in fact helped her lose over 70 lbs in one year.